The Google Nexus Sailfish was spotted on AnTuTu last week, and now today, the Nexus Marlin has made an appearance on AnTuTu as well revealing (or we would rather say confirming) its specifications. Going by the AnTuTu listing, the Nexus Marlin is powered by Snapdragon 820 SoC which is coupled with 4 GB RAM and backed by Adreno 530 GPU. The device is listed with 32 GB internal storage and runs on Android NMR1 (7.0) which refers to Nougat Manufacturer Release 1. 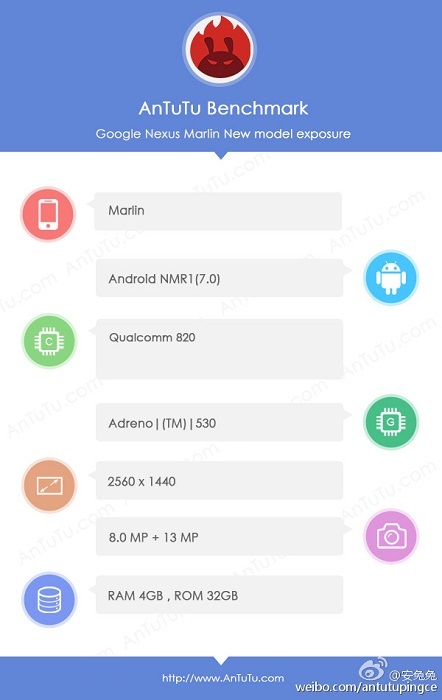 The Nexus Marlin features a 13 MP primary camera at the back and an 8 MP secondary camera on the front. While the size of the screen is not mentioned, the resolution stands at 2560 x 1440 pixels. There’s no information about the battery as well on the AnTuTu listing, but going by the past rumors, we should expect the device to ship with a 3450 mAh battery. The Nexus Sailfish and Nexus Marlin have both received FCC certification and hence we are expecting the devices to be unveiled by the end of this month or sometime in September. The FCC certification has also confirmed that both the Nexus smartphones of this year are indeed built by HTC. Also, both the devices are said to sport identical hardware with the only difference in screen size, screen resolution and battery capacity. Nexus Sailfish will be the smaller smartphone of the two with 5-inch Full-HD display and 2770 mAh battery, whereas, Nexus Marlin will sport a 5.5-inch Quad-HD display along with 3450 mAh battery. Remaining specs common for both the devices include USB Type-C, Fingerprint Scanner at the back, bottom-firing single/dual speakers, headphone jack at the top and Bluetooth 4.2.